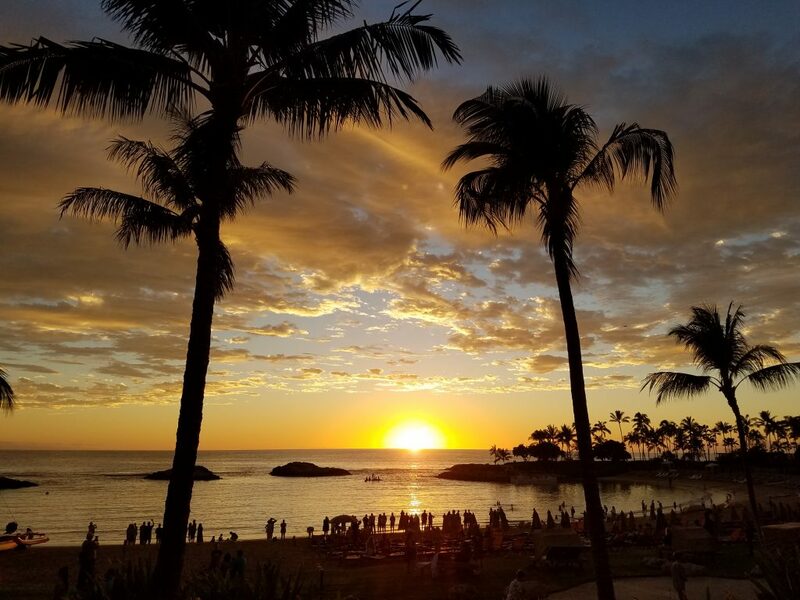 Recently, I was delighted to escape from the cold snow to Hawaii with the family, (including my 4½ year old, and 15 month twin grandchildren). We stayed at the Aulani Disney Resort on Oahu, by the ocean, for a wonderful sunny week of playing outdoors. We visited the Dole Pineapple Plantation which had gorgeous lush gardens and a nice patio to eat lunch and delicious Dole whips, (vanilla ice-cream swirled with pineapple syrup). 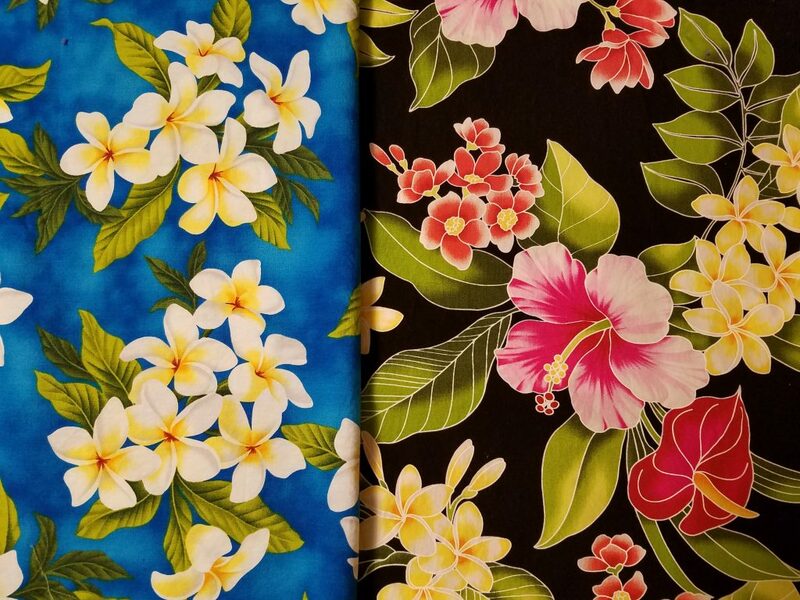 At the back of the enormous store, I found a fabric vendor selling cuts of Hawaiian cotton prints. How could I resist?! 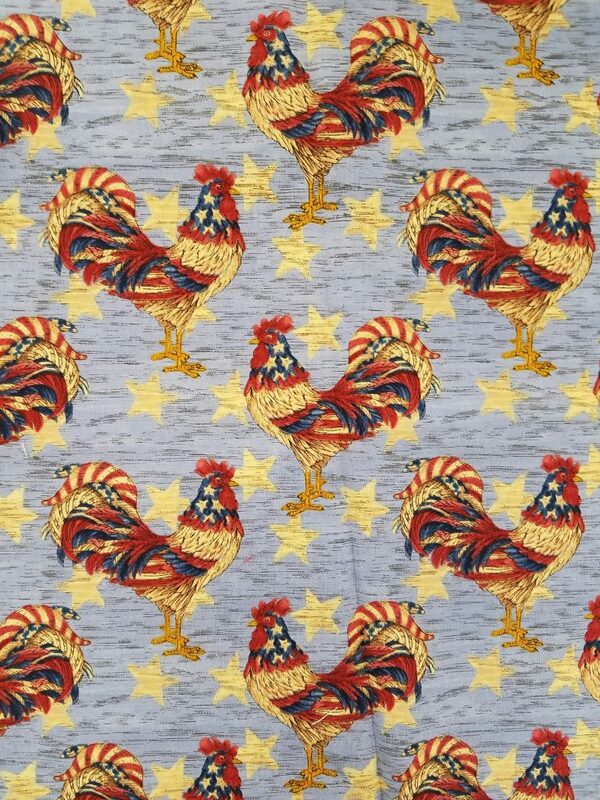 I bought two yard chunks of each of these two fabrics, (see below), with no specific project in mind. With a large fabric stash at home, I try to be disciplined about my fabric purchases, but made an exception here since I was on vacation and needed souvenirs! There can always be some justification for fabric purchases and perhaps just liking it is enough…. 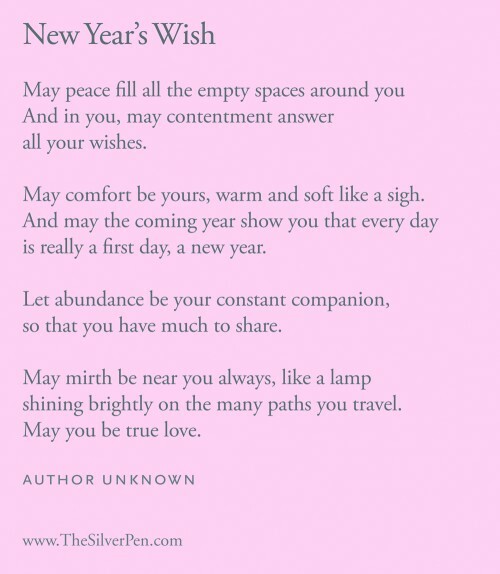 Wishing you Peace, Love and Joy for 2019. 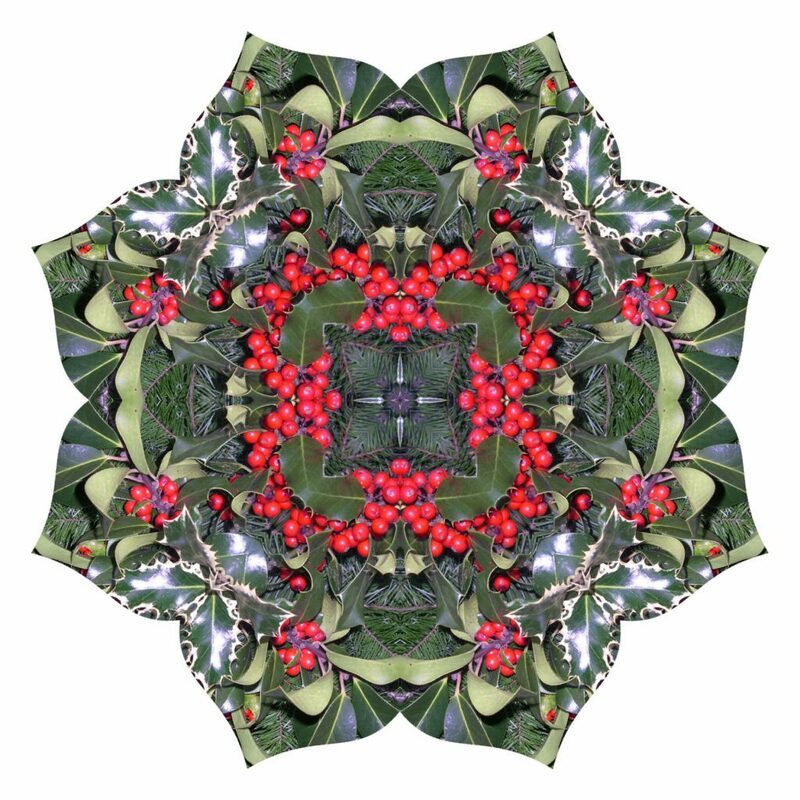 Image designed using a photograph of one of my quilts, Stars at Sunset, manipulated with Kaleidoscope Kreator software. 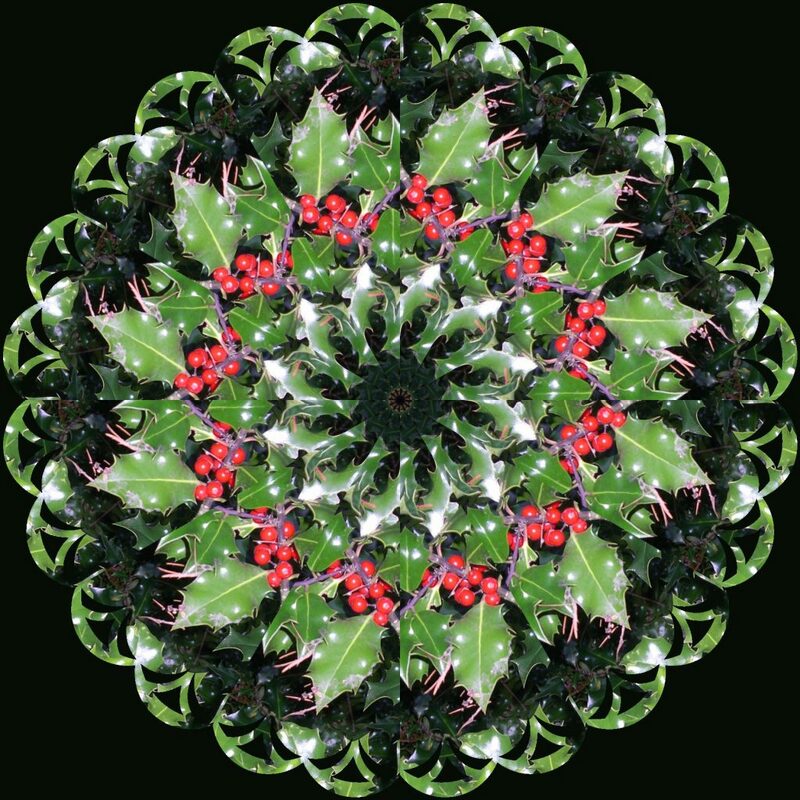 Merry Christmas and/or Holiday Greetings! Wishing you all the best for this festive season and the new year to come! I wish you a Happy Thanksgiving and hope that you are sharing the day with family and friends delighting in good food and fellowship. I have much for which to be grateful this Thanksgiving, including the recent birth of my twin grandchildren! I also greatly appreciate the friendships I have made through quilting and traveling to share that passion throughout the United States and beyond. 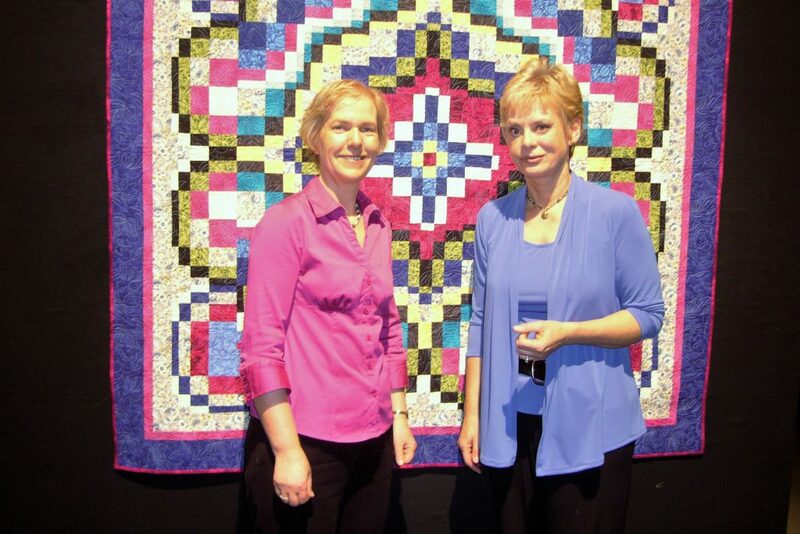 Last week, we said farewell to Nancy Zieman who passed away after a battle with cancer. She was such an inspiration to so many people and she will be greatly missed. Thank you Nancy for your wonderful contribution to the quilting and sewing world. Sewing with Nancy was the longest running sewing and quilting TV program ever, with over 30 years of programming in which Nancy taught numerous techniques and invited other teachers to share and participate. 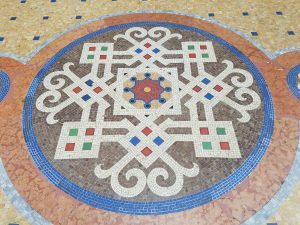 I had the privilege to be interviewed about the Mongolian Quilting Center twice for Nancy’s Corner and to do a two part series with her on my Bargello Quilts with a Twist technique, and so I appeared in four Sewing with Nancy programs. The photo was taken during our recording of the Bargello Quilts with a Twist programs. Nancy had friendly and comfortable manner which came across in her TV teaching and endeared her to her large audience and devoted followers. She immediately made me feel at ease in the TV studio. She was also extremely professional and thorough in her approach. It was a pleasure to work with her and a great experience. 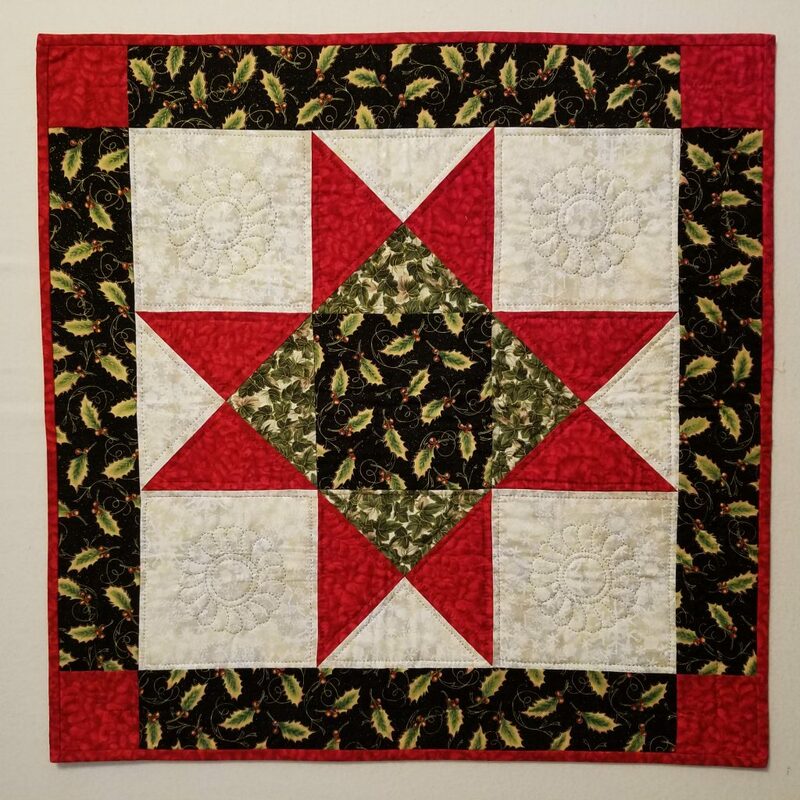 The company that she founded, Nancy’s Notions, lives on and is a great resource for sewing and quilting supplies. For a wonderful YouTube tribute to Nancy, click here. 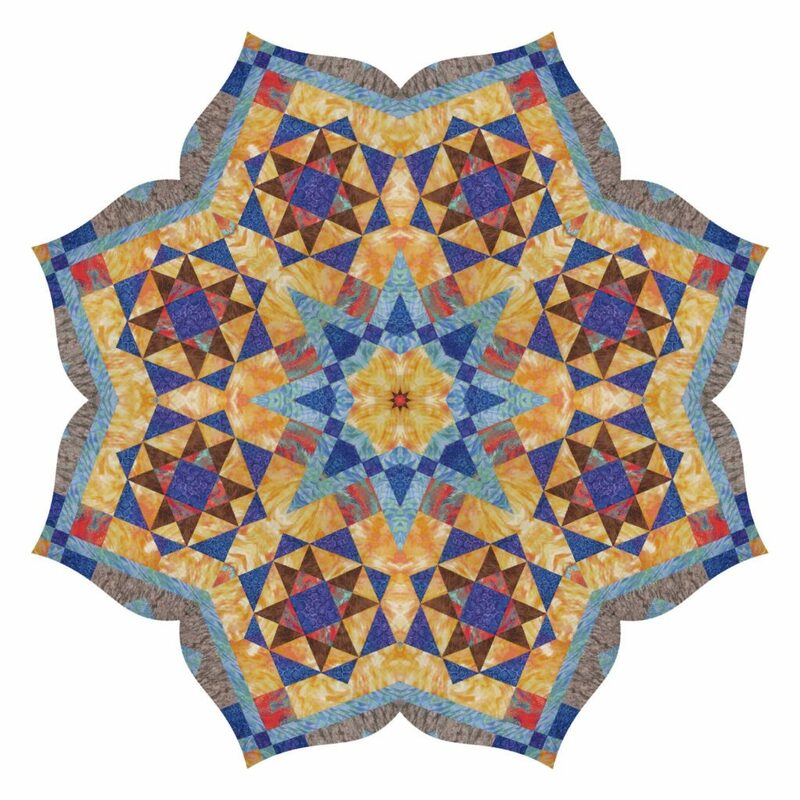 Earlier in the month, I taught at the Thumb Butte Quilters’ Guild in Prescott, AZ. 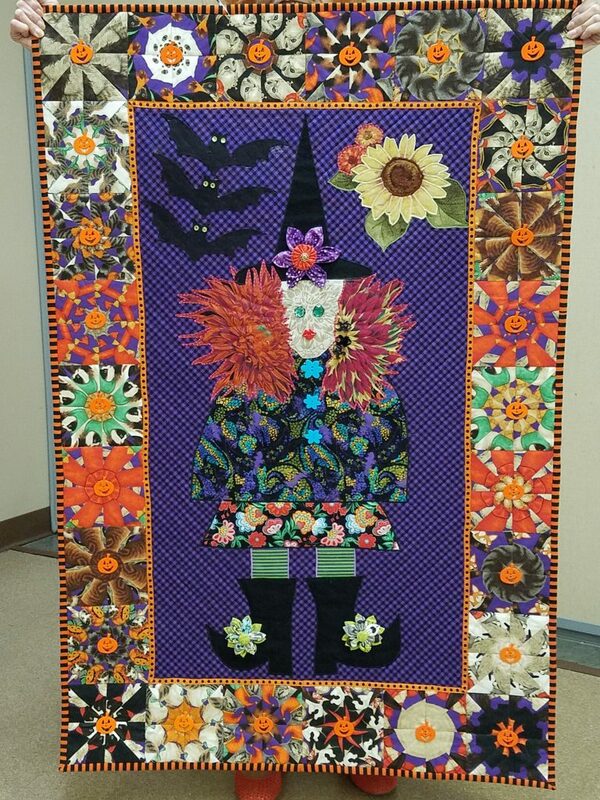 This wonderful Hallowe’en quilt was shown at Show and Tell after my lecture. Princess Kat-Rina was designed and pieced by Betty Foley of Prescott. This gaudy witch-princess rescues cats. I like her stripy green leggings and floral accents. All the Stack ‘N Whack blocks in the borders are made from cat fabric. What fun! Notice how the centers of all the blocks are pumpkins. The orange dot fabric makes a great frame around the pictorial center, separating it from the border blocks. I also really like the orange and black striped binding. This is an entertaining and decorative piece, guaranteed to bring a smile. Thank you, Betty, for allowing me to share your creative art. 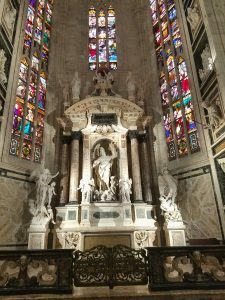 In July, I spent time in Italy in the Piedmont area with friends who recently moved there from the US and we went to Tuscany together. 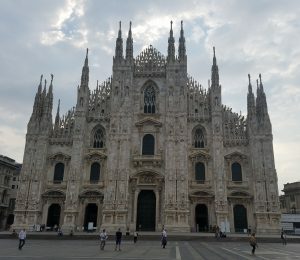 My last night in Italy was spent at a B & B close to the airport, then I had a morning to explore Milan before flying to the UK. 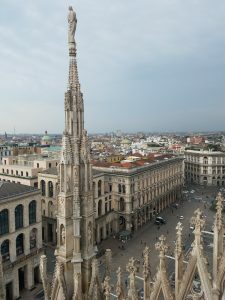 I caught an early bus into the city center of Milan and spent three and a half hours at the Duomo (Gothic cathedral), the Galleria and the Teatro alla Scala. What I saw was fantastic and very inspiring. 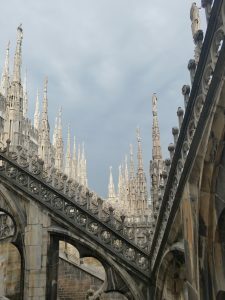 The sheer scale of the Duomo was so impressing and it was majestic with its towering turrets, magnificent stone carvings and windows. 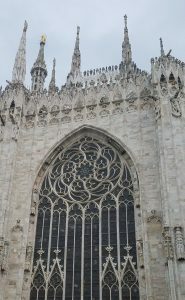 The combination of angular shapes and smooth curves was fascinating, and I felt awed by the grandeur of it all. I’m sure that experiencing something like this influences me when I am designing quilts, even if it’s in a very subtle way. 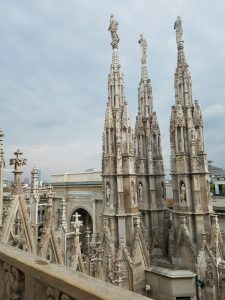 I climbed up to the roof top for amazing views of the skinny turrets, flying buttresses and the surrounding city. 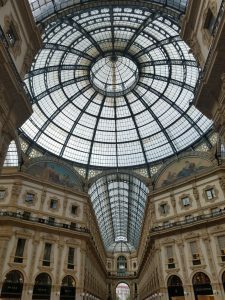 The Galleria was spectacular too with the arches, domed ceiling, decorated floors and fancy stores such as Gucci and Prada.